I am a lipstick hoarder. It's true, I confess. My collection just keeps growing and growing and there's not a shade of pink, purple, orange or red that I don't want to try! So when new lipstick ranges released my first reaction is to try them out and check out all the colours that are available. 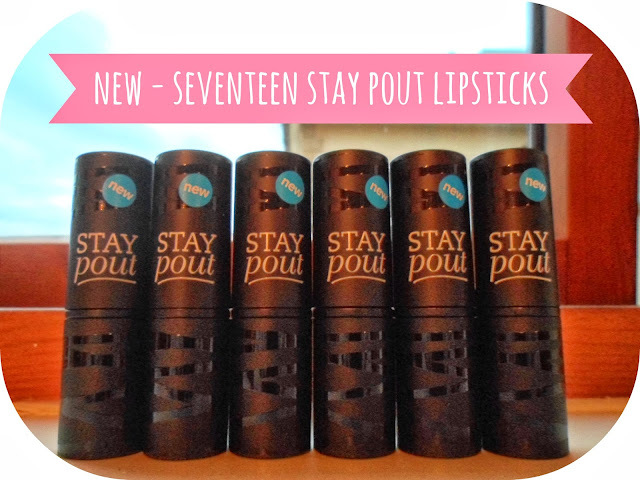 This happened recently with Seventeen's new lipstick collection - Stay Pout. I first heard about these whilst flicking through a beauty magazine a while ago and seeing a photo of the colour "Rule Breaker" - now this year I'm all about trying darker shades and venturing out of my comfort zone so I knew that I had to find this gorgeous plumy-red shade and try it out. So when I saw the collection had been released I headed straight for Rule Breaker and swatched it! It was so pigmented and felt nice and hydrating after just one swatch that I was immediately sold and seeing as they were on offer (3 for £10 on all Seventeen products) I decided to grab another.... 5. I know, I know - issues. I got a range colours from the dark reddy-purple to a cute baby pink and have been so impressed with them! They are probably about average in price for a drug-store brand lipstick at £4.49, but like I said at the moment Boots have all Seventeen products 3 for £10 which is a bargain - basically getting one for free! All these colours are fabulous and amazing additions to my ever growing lipstick collection. I got such a mixture of shades from the dark purple/red of 'Rule Breaker' to the bright orange shade 'Make An Entrance' to the gorgeous baby pink 'Kiss Me Quick' I'm so glad I got such a wide range of colours. 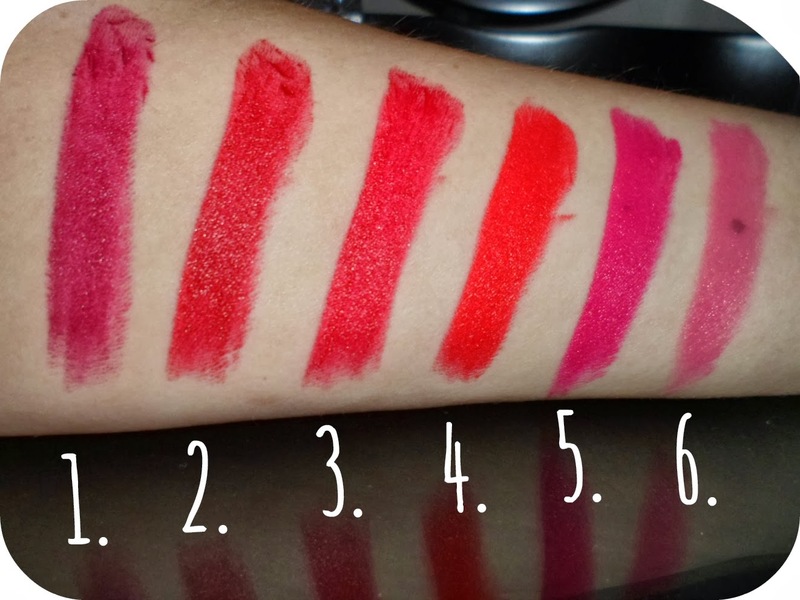 And even though shades 2 and 3 look similiar in the swatch there is a big difference in the shade of red which you can see in the previous photo of the lipsticks. I think my favourite though has to be Delinquent - the gorgeous bright fuschia pink! All these colours stay on so so well and keep the lips looking and feeling moisturised another great make-up purchase! Have you tried any of the Stay Pout collection yet? Any colours you fancy trying out? Wow...though I'm not a fan of lipstick but the colours are amazing. I'm amazed that when swatched it came out in a different colour. AHHH these all look brilliant! We've got 'It's a Kiss Off' which we've not tried yet but looks AWESOME. WOW...I loved 4 and 6 and 3 and 2 and 5 and 1 ...LOL!! I too horad lipsticks. Loved them all...couldnt decide! Delinquent looks stunning! I've never tried any Seventeen lipsticks and really don't need anymore lipstick but they do look lovely.. I may have to have a little swatch.. 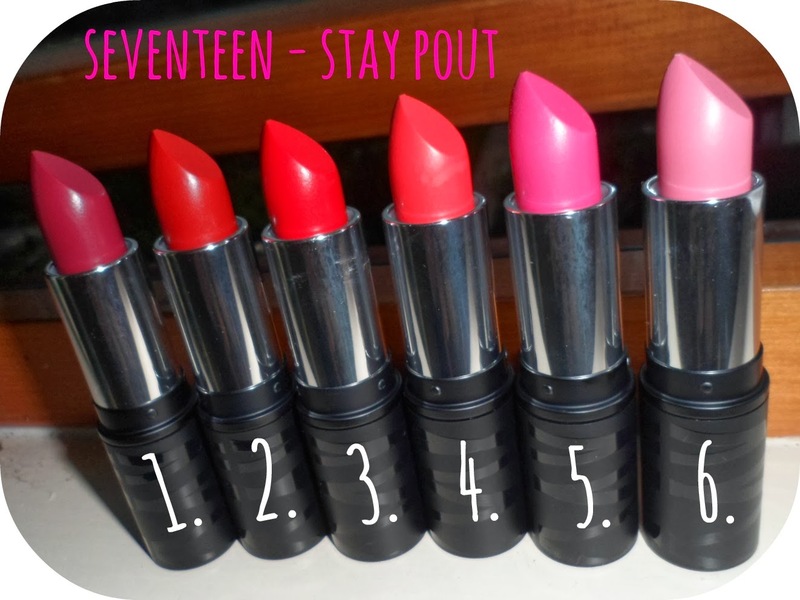 I have such a lipstick addiction but never tried Seventeen before, although I use so many of their other products. I am after a new red at the moment so I will have a look at these for sure, Infared looks gorgeous. I'm a lipstick hoarder too! Haha, these look awesome... I think I'm heading over to Boots too... I think I'm set on getting Rule Breaker, Make and Entrance and Delinquent! Great post, you've convinced me! Oh these sound great, I love Make an entrance its such a gorgeous red! These look great, definitely want to give them a try! I've just done a blog post on Rule Breaker I love the stay pout lipsticks they last forever! Just wanted to let you know that having only just stumbled upon your blog, I am really enjoying it! The layout and aesthetic is really nice. It seems like such a happy blog, hehe! I must confess also, I am a Lipstick hoarder. I just can't help myself. These colours look beautiful and I can't wait to get my hands on them! Just followed you on Bloglovin' since I'm enjoying the posts so much!